Scientists have demonstrated a "runaway evolutionary effect" that is speeding up Australia's cane toad invasion. This explains why the invasive toads have increased their rate of spread so dramatically, the researchers say. They found that toads living at the very edge of their range were "super-invaders" - able to move beyond the boundaries of this existing habitat. And when toads at the frontiers bred, their offspring inherited this ability to move quickly into new territory. This phenomenon, which scientists have termed the Olympic Village Effect, has been proposed before, since these same scientists observed that the toads at the edge of the range had bigger front legs and stronger back legs - all the better to jump and to invade new areas. In this study, the researchers tested the effect, essentially setting up a cane toad race. Dr Ben Phillips from James Cook University in Queensland, Australia collected cane toads from four different populations. He captured ten toads from the core population in northern Queensland, and ten from each of three populations that were increasingly distant from this point. 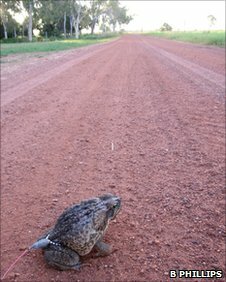 He took the toads to a facility in the appropriately named Middle Point near Darwin, where he fitted them with radio tags and then released them. The tags enabled the scientists to follow the toads' progress. As Dr Phillips expected, toads that were collected from the edge of the range were much faster movers. To confirm that this increased strength and speed had a genetic basis and could be inherited, Dr Phillips studied a generation further. He allowed toads from the same population to breed. Then he set up another radio-tagged toad race, this time between these captive-bred offspring. Toads that had parents from the edge of the range won the dispersal race, revealing that they inherited their speed and strength from their parents. "It's bad news," Dr Phillips told BBC News. "It means they're getting faster and better at invading new areas." Even worse, the researchers say, all animal invasions are likely to follow this pattern. He explained that the faster moving toads even reproduced more quickly. But this could point to a chink in their biological armour. "They have to be trading something off to do that," he said. "And one of the things we suspect is that they're trading off their immune systems." Since the bigger, faster toads spread and breed so quickly, they are likely to leave any endemic diseases and parasites behind them because toads that move so quickly are likely to be disease-free. This could mean that they and their offspring have less natural immunity. If this is the case, it could help scientists develop some sort of biological defence against the toads. "If you re-introduce [these] parasites at the edge of the range, perhaps you could slow down the invasion," said Dr Phillips. He and his colleagues plan to study the creatures in more detail in the hope of pinpointing some of these biological weak spots. 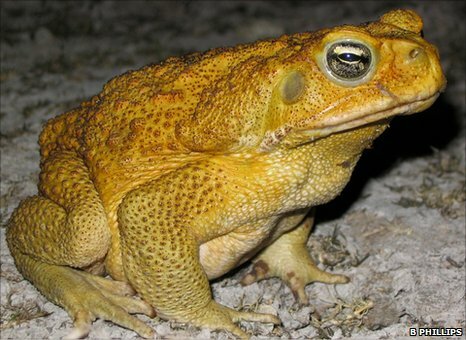 Cane toads were introduced to Australia in 1935, to north tropical Queensland to control sugar cane pests. They failed to do this, but succeeded in becoming one of the International Union for the Conservation of Nature's (IUCN) top 100 invasive species. Their range now extends through most of Queensland and into Australia's Northern Territory. "They're certainly up there with the worst invasive species," said Dr Phillips. "They're doing well for themselves, you have to give them that." The work was published in the Journal of Evolutionary Biology.